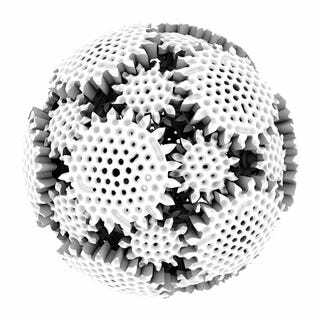 New York-based Proxy Design Studio has given Gizmodo a first glimpse of its incredible, 3D-printed spherical gear called the Mechaneu, equal parts tactile toy and mechanical sculpture, a mind-bogglingly precise intermeshing of wheels within wheels. Created in a one­-shot fabrication process, Mechaneu #1 features an elaborate network of interlocking gears and support structures. Spin one gear and the entire sphere is catalyzed with the rotation. 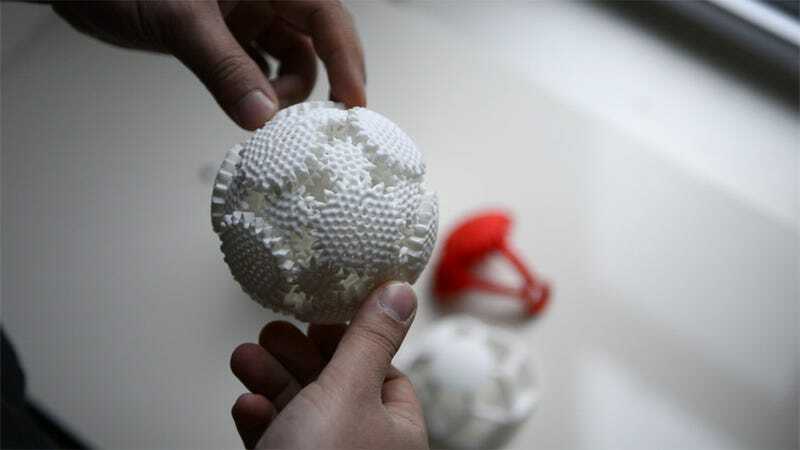 The effect is mesmerizing, a visualization for the eye and a tactile experience for the hands. The Mechaneu design explores the limit case of commercial 3D printing; all aspect of the design are calibrated to the minimum thicknesses and maximum detail levels. Their video explains it all in more detail, including some zoom-in/zoom-out diagrams of the assembly process (a few of which have also been included, below). But it's the insane, nested spherical rotation of this thing—or, rather, the fact that it works, and that it came from a 3D printer—that blows my mind. —fitting together down to the millimeter. It's hard to believe such a mechanism actually works. As Proxy points out, "The support structure was modeled in the same software used to develop architectural structures and arguably contains the same amount of elements and detail as a building—in one millionth the volume." Architecture, measured by density. In any case, Mechaneu is available for sale now, and can ship in time for the holidays. The sculpturesque toy—it's 3D-printed, so don't drop it!—can be found at Proxy's Shapeways shop (and, presumably soon enough, at every toy shop near you), where it can be ordered in both a white and four colored options. Stay tuned to their Shapeways page for future variations. The designers remind us: "As the state of the art in 3D printing evolves, the Mechaneu series will evolve with it, each version officially retired so as to ensure it remains identifiable as a small­-batch, limited edition sculpture."